Does getting high make you better at games? Legit experiment: we smoke a lot of weed to practise for Snoop Dogg’s gaming league. I am currently very high. Please don’t call the police, though, because I’m also in Amsterdam. Here, cannabis is legal, and the police not only can’t arrest you if they see you smoke it, but are legally obliged to wink at you, and then say, ‘nice’. I read that on the internet somewhere. Why am I high and in Amsterdam and constantly winking at police? Like many things in my life, I owe this one to Snoop Dogg. With news dropping last month that his new Gangsta Gaming League will “most definitely allow the use of cannabis,” I wanted to see if sweet Mary Jane would improve my mouse and keyboard skills. Or just make me want some crisps. Now, this is in NO WAY a recommendation that you smoke weed. Definitely not. No endorsements here. But, if it’s legal in your country, there are worse ways to jeopardise your future. So join me as I smoke weed, play games, and see if I instantly become a pro gamer. Please bear with me. I’m new at this and have already coughed one thousand times. The Gangsta Gaming League livestreamed a Madden NFL 19 tournament from the rapper’s permanently hazy LA compound on March 15. 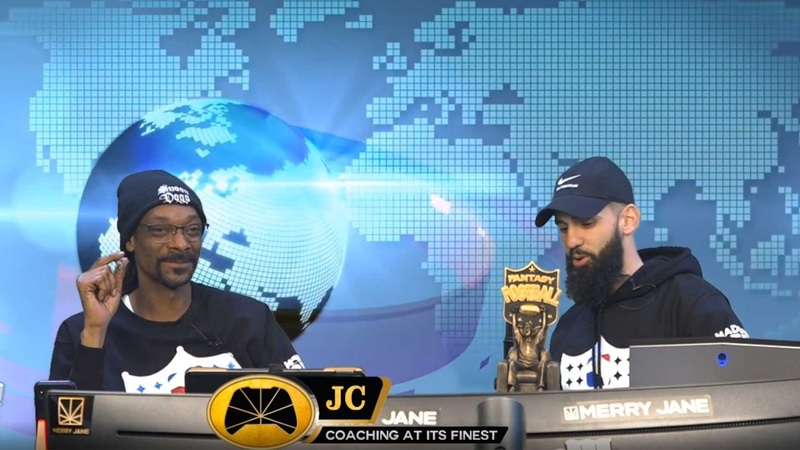 Snoop was on commentary duties, armed with a mic, weed, and two bleary eyes. You can catch up on it here . If you’ve not got six hours to spare though, basically, it was a great success and no one was seriously injured. That was all the convincing our HR department needed to give this article the go-ahead. While the GGL streamed Madden NFL 19, my experiment must be done with Fortnite, because I only have a laptop with me in this Amsterdam cafe and it’s the one multiplayer game I’ve downloaded on it. Look, I’m no Krishnan Guru-Murthy – he would have prepared better. Anyway, let’s get this started… once I’ve googled more synonyms for cannabis. Will a bit of ‘herb’ make your Fornite session supherb, or will the ‘roach’ make you choke? I have no idea. As my first game loads, I suddenly feel very awful. It’s like my field of view has receded and I’m looking at my laptop through a keyhole. This might be down to taking ten massive puffs of my 100% pure weed joint because I didn’t think it was working. In hindsight, I should have given it a moment. I drop into the map before I even know I’ve dropped into the map. My actions are on a five-second delay. I am now divorced from time. As far as pro gamer strategies go, it’s a bold one. Running on pure instinct, I set off on the hunt for a better gun, but it’ll be wasted in my hands, which I think are disappearing. What little skill I once had is now sorely depleted. I’m minutes into my first game and playing it while high already feels like a handicap. My brain is laggy and my thoughts are buffering. This is almost certainly my fault. I have done too much green. 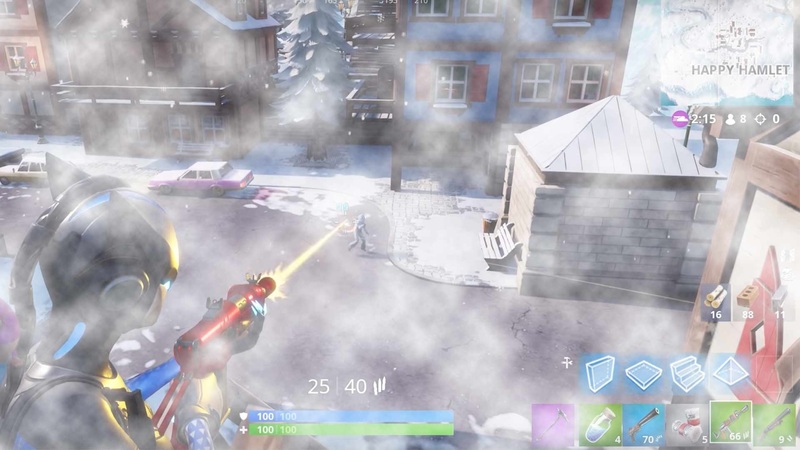 My tactic for the remainder of the game is to avoid people, which is probably what I would do if I wasn’t playing Fortnite, really. As I head to the sanctuary of Happy Hamlet, I’ve noticed my foot is tapping under the table. This is completely involuntary. Other physical symptoms include dry mouth and exaggerated expressions. To give you an idea, imagine a normal facial expression, but you’ve input ‘500%’ into the values field. I am now a prop character in Garry’s Mod. Game audio is weird too, like I’m listening through a periscope. Visually it looks like I’m seeing through a periscope. Wait, am I on a submarine? Not to be dramatic, but my soul is definitely splitting from my body. I’ve got images in my mind of that bit in Peter Pan where everyone’s shadows come off. It’s like that but with lots more panic. A less whimsical, more hysterical Peter Pan. That’s what this is. I don’t believe it’s the optimal mindset for a competitive multiplayer game, and I have questions for Snoop Dogg. In my experience, getting high has no tangible benefit to your gaming skill. Again, in my experience, getting high made me feel like that tiny alien in Men In Black who is operating the robot man from inside the man’s head. Finally, it is not advisable to visit a kush cafe alone, order the most potent jazz cigarette, then smoke it rapidly. It is for these reasons that I must respectfully decline Snoop Dogg’s invitation to join his gaming league, should he ever send me one.